Below is a summary of some of the carbon accounting done for the Dalney Building for Georgia Tech, presented to the client in late 2017. 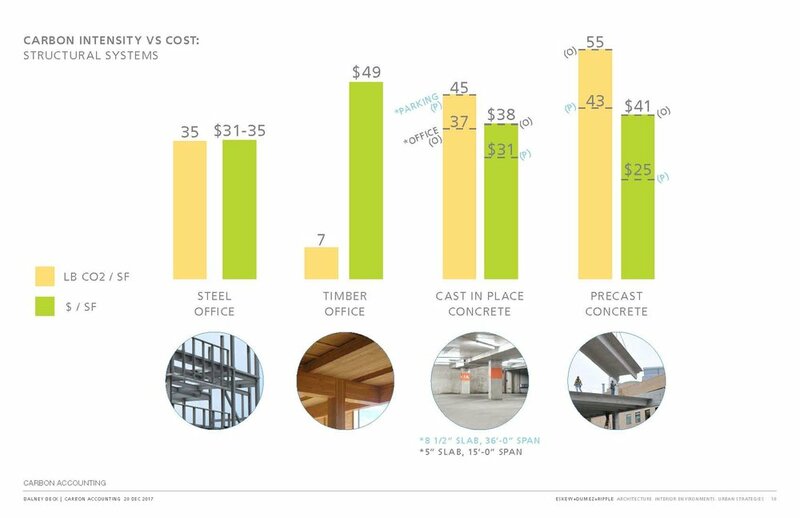 Below shows the difference in expected carbon emissions between building the office portion of the project and operating it with the standard Georgia utility mix versus photovoltaics or another carbon neutral source. A debate emerged early in the planning process. As parking needs change, what are the CO2-specific implications between building the garage, demolishing it and building office space in its place versus building a garage that could work structurally for parking and then be converted to office? These were termed the non-convertible and convertible schemes respectively. I compared other possible structural systems including notes on office versus parking uses for cast-in-place and precast concrete systems. The cost per square foot numbers are approximations as provided by the general contractor. Generally, office loads are greater and require more structure – hence higher CO2 output as seen clearly in the precast systems proposed at Dalney. Interestingly for cast-in-place, the CO2 output in construction is higher for a parking garage than an office. This is due to the spans - longer spans are preferred in parking garages and to achieve these with cast-in-place concrete requires a much thicker slab which significantly increases CO2 output. A final scenario / thought-experiment was brought into play – the possibility of building both the convertible and non-convertible options out of precast. In analyzing the structure between the convertible and non-convertible precast options (not including further cladding, etc. ), we estimated that the CO2 savings in building a convertible scheme out of precast was relatively small versus a lighter precast option that would be demolished to make way for a new steel-framed office building. The carbon difference in demolishing a parking structure versus renovating are significant though perhaps not exorbitant. The fact that the inherent structural system in precast for a parking garage is “lighter” than a convertible option and that any new office building would be built in steel (which has assumed high recycled-content and recyclability) mitigates the difference. The Tally tool developed by thinkstep, KT Innovations & Autodesk was used in the analysis. Using Tally made this analysis possible, though it is only as good as the assumptions made within the software. We consider the emissions numbers to be approximations – more to compare options in a relative sense than an absolute one. We correctly assumed that the economic factors would play the biggest role in the decision however we wanted to use this project and parking-garage debate as an opportunity to synthesize and present the CO2 impacts to the client along with the monetary ones.